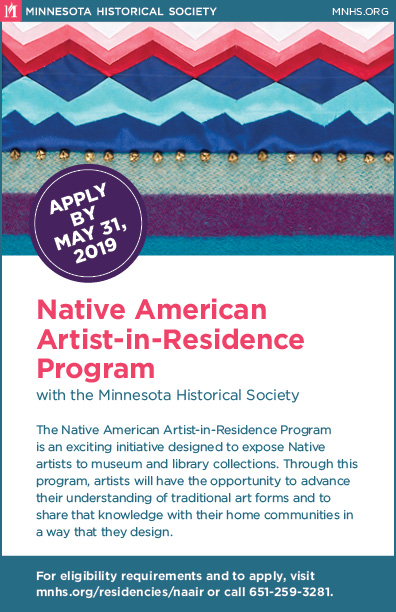 The Minnesota Historical Society is seeking applications for the 2019 Native American Artist-in-Residence Program. In 2019, the program will award two residencies for Native artists engaged in traditional artmaking and provide them stipends to connect with museum collections, peer artists, and/or other knowledgeable community members. Artists must currently reside in Minnesota, Wisconsin, North Dakota, or South Dakota. Apply by May 31, 2019. For more information, please visit mnhs.org/residencies/naair and https://www.facebook.com/mnhsnativeartistresidencies.